Copyright Conja Summerlin. Used by permission. My Grandpa Roy died too young and left me clinging to a few mementoes and a handful of memories—scarcely enough to last a lifetime and not nearly enough to show those who didn’t know him the true magnitude of the man he was. As near as family can calculate, there were between 1,500 and 2,000 people at his funeral, which was held at the small Free Methodist church in Salina, KS. The sanctuary and overflow seating where completely full an hour before the service began. Visitors stood in the foyer, gathered in the fellowship hall, collected on the stairs and finally piled six-deep outdoors, peering in through the stained-glass windows to pay their respects to one of the city’s best-loved men. These are the concrete details that prove the worth of my grandfather, Roy David McCall. As his oldest grandchild, I don’t need the approval of a town or the testimony of strangers to validate my recollections. Memories of the time I spent with him are testimony enough. Nothing came easy for this man, but he grabbed life with gusto anyway. And he loved me—loved me unconditionally, as dotingly as any grandparent ever adored a grandchild. Grandpa Roy often showed his love through his sense of humor. Many of his jokes have become the stuff of family legend. “I never had a degree,” he would announce in a voice touched lightly with a Kansas drawl, “but I have had a temperature sometimes.” His sense of humor carried into his personal life too. Whenever his wife, Grandma Nori, got hot under the collar over one thing or another, he would comment to observers, “Isn’t my wife cute when she’s upset?” Although he died when I was only 13, Grandpa Roy was the one who taught me how to avoid taking life too seriously. No lesson from him has stuck with me more than the lesson about flexibility that came the year he started a family Christmas tradition. Grandma and Grandpa loved getting bargains in the after-Christmas sales each year. One year, Grandpa found enough matching Christmas ornaments in a bargain bin for each of his grandchildren. He purchased them and put them aside for the following year, and thus began the tradition of giving a Christmas ornament to each grandchild very Christmas. I must have been about 10 years old the first time Grandpa gave all of us Christmas ornaments. That year, each grandchild received a colorfully painted Pinocchio ornament in addition to our other gifts. My younger sister and I had just finished collaborating on a decorating project in the room we shared, and I was appalled that evening when I found that our beautiful, blue rose bedroom now featured an out-of-place Pinocchio, cheerily hung from a vent on the wall. My Pinocchio was carefully packed away with the family Christmas ornaments, and I pleaded with my sister to put hers where it belonged. The way she saw it, he already was where he belonged, and since the vent was on her side of the room, all I could do was try to ignore what I considered her lack of design sense. After that Christmas, Grandpa made a habit of getting each grandchild an ornament for Christmas. He would purchase them on sale on the 26th of December, and I soon began looking forward to unwrapping these treasures. My sister, a few of my cousins and I still have our Pinocchios, a pair of hand-painted wooden mice, and a festive sleigh, all lovingly chosen for us by Grandpa Roy. After he died, we learned that he had planned ahead, and for another two years, we continued to receive ornaments that Grandpa had selected. Being the oldest of 10 cousins, I am one of few who remember Grandpa well. In fact, my youngest cousin hadn’t yet been born when he passed away. Grandma Nori kept up the tradition of giving Christmas ornaments to each of us every year. As the grandchildren married, she added ornaments for each spouse as well. Her selections were specific to the recipient. As precious as all these gifts were, Grandpa’s Pinocchio held the most precious place in my heart. Grandpa Roy died suddenly of a heart attack two weeks after Christmas. The funeral service for his mother, my great grandmother had been held on Christmas Eve that year. Afterward, I received one of the greatest gifts of my life—Grandma Nori and Grandpa Roy came home with us and spent Christmas Day at our home. Nearly 30 years later, I’ve forgotten most of the details. Other family members tell me that Grandma was sick with gall bladder issues and they left early as a result. I remember hanging out in the living room telling jokes with Grandpa. I remember unwrapping his primary gift to me that year—an NIV Bible with a green leather cover and my name in gold lettering on the front. I remember his hugs, his ready smile and his gorgeous, ice-blue eyes. I remember the face that has haunted my dreams ever since because I didn’t know that was the last time I would ever see him alive. I grew up, went away to college, then moved into my first apartment in Kansas City. With me came my box of Christmas treasures, featuring the still-growing collection of ornaments from my grandparents. During my first Christmas season after college, my sister came to help me decorate the apartment. As often happens with young adults on their own for the first time, we made do with what I had. We trimmed the tiny fake tree that I brought with me from college and used the rest of my ornaments to adorn a large philodendron. A fight nearly broke out when I looked up from decorating the tree to see that Joy had hung my Pinocchio from a vent high on a wall opposite the other Christmas decorations. She insisted that it belonged there, and for some reason, I relented. Truthfully, the wood ornament was too large for the limbs of my tiny fake tree anyway. Somehow, this incident began a Christmas tradition. Although Joy had her own apartment and her own Pinocchio that always managed to be hung on a proper tree, she came to my home each year to help decorate for Christmas. Each year, that silly wooden puppet would be hung on a vent somewhere in my home. For her, the game was threefold. Annoying me with the puppet’s antics had its own reward, but even more fun for her was seeing how long it would take me to find the vent where she had hung Pinocchio that year. After Christmas, the game continued as she would come to visit in order to learn whether or not I had managed to find Pinocchio and put him away with the other Christmas things. Half the time, Pinocchio remained on the vent throughout the year. Time marched on like a line of toy soldiers. My sister married and had children who helped put her Pinocchio and the other ornaments on her tree each year. I married too, and shortly after the first Christmas in our new home, my spouse and I wound up homeless. Pinocchio and all the other ornaments were lovingly packed away and kept in storage as we couch surfed through the homes of hospitable friends until we could get back on our feet. 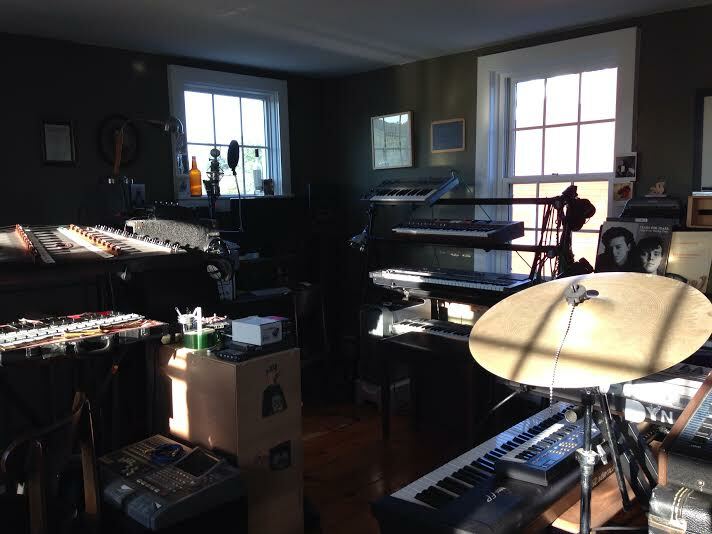 The week before Thanksgiving of the following year, my spouse and I moved into an apartment of our own only a few blocks away from where my sister and her family live. They came over after Thanksgiving to help us unpack and assist with decorating for Christmas. 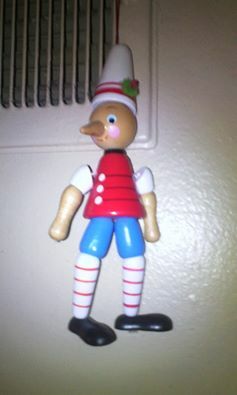 Joy spotted Pinocchio, grabbed him, and immediately hung him on a wall vent near the ceiling. I laughed, relieved that my life was returning to normal. Since then, the tradition has continued. Every year, someone hangs Pinocchio on a vent. About half the time, I forget to put him up after New Year’s Day, and he cheerfully stays out all year long. A popular children’s book called “The Elf on the Shelf” has garnered attention in recent years. The concept of placing a stuffed elf in various places around the home to be found seems strange to me—just as strange as hanging a wooden ornament from a wall vent seemed on that first Christmas over 30 years ago. But it wouldn’t be Christmas without my little wooden puppet. Who needs an elf on the shelf when I have my Pinocchio on a vent?